Late Thursday morning, New Year's Eve, with feet still banged up from a nine-hour ice-climbing outing at Smugglers' Notch the day before, I'm in the office catching up on work. I call a contributor to go over the latest news and he says that the Aspen Times reported an ice climber died after a fall in Redstone, Colorado, but his name had not yet been released to the public. 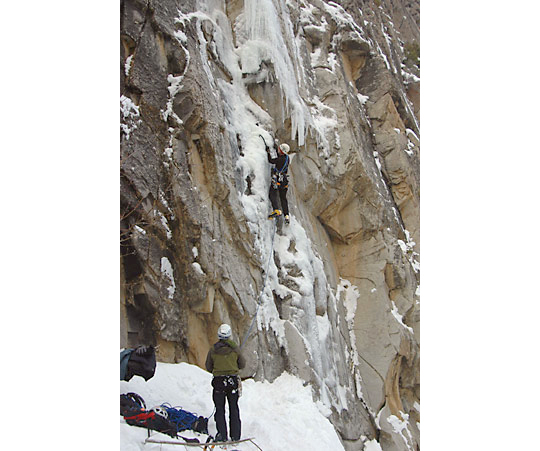 Redstone, seventeen miles from Carbondale, in the Roaring Fork Valley, is where I learned to climb ice ten years ago. I've since stayed in touch with many members of the community, so I likely knew the climber. I called my old climbing partner Mike Schneiter, and I asked if he knew who died. "I do," he said. He paused. "You do, too. It's Ryan Jennings. He was at the Redstone Slabs. He'd been climbing a pillar that [rarely] forms. It collapsed." Ryan was alone on the WI5 ice pillar, located more than 1,000 feet above the road. I'd been on the phone with Ryan only a few weeks ago to congratulate him on winning a grant from the Mugs Stump Award committee to climb the West Face of Middle Triple Peak in the Kitchatnas, in Alaska. I still recall his sandy voice when I called him from the Bozeman Ice Festival, in Montana, where the winners would be announced later that evening. "[Kevin Cooper and I] prefer to pack as much fun and suffering as possible into each day in the hills," he wrote in his grant application. "We have always returned to hard mixed climbing as our true calling, and hope to combine this with aid and free climbing to connect systems up Middle Triple Peak." 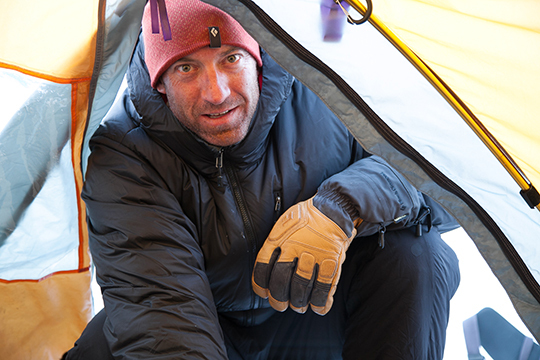 "I look down at Coop [Kevin Cooper] wrapped tightly in his bivy bag. Spindrift gently covers him till he blends in with the ledge. A peaceful presence hangs in the air. I think of the splendor of life that has led me here. I feel connected to the creator, as if I'm merely an extension of senses sent to experience this place and this moment. Soon I lie back for some sleep, wondering if Coop also feels this connection. For the moment, I'm happy. 'This is the life, Coop,' I say. 'Sure is...sure is,' he replies, too tired to say more." Ryan Jennings was one of the first people I climbed ice with, when I followed him up Bonzai Pipeline (WI5 M5, Raleigh-Takeda, 1993), a rarely formed, desperately runout route near Redstone. I met Ryan after hiking to the crags with BJ Sbarra and BJ's wife Tracy Wilson. I nervously held the rope that day as Ryan made his way up the route's first pitch. Twenty feet off the ground, he swung a tool around and, using the ice axe handle, bashed a few knifeblades into the granitic choss, then carried on. Watching him climb was one of the most impressive performances I'd ever seen. Above the pins, he climbed a thin varnish of ice over bare rock, stopping to place gear only a few times. In that one-rope length, Ryan became a superstar in my mind. "Five a.m. We sit to brew up under dim skies, two hours after the alarm's first ring. Trees creak in the breeze. I breathe in the fresh morning air. Snow has fallen in rhythmic stages recently, and warm days have combined with cool nights. I envision ice forming up high, ribbons of white snaking down, over constrictions, filling in steep sections of rock. These choss mountains will be safest when ice and snow bind rock together, when the powder and slabs finally blend and sunny faces harden into sheets of neve." On the day Ryan died, Tracy Wilson recounted: "Our climbing community lost an incredible member. Ryan was an inspiring family man. We're all devastated." Tracy passed the phone to BJ Sbarra. "He was the conservative one, being calm, and conscious—he was in control all the time," he said. "It was one of those freak things. It's like when ten people ski a slope and the eleventh person hits that one spot that triggers the slide. When I saw the pillar was in, I immediately thought of him [wanting to climb it]. He was solid, wasn't reckless." Jennings is survived by his two children and his wife Robin Beck-Jennings. Ryan loved the mountains in a unique and special way. To use language like "hobby" to is all but discredit your view before you start. If there is ever a small corner of the intraweb were a "quiet warriors" memorial should stand proud...you have found it billgriffin. bharder, Are you oblivious to how dangerous this hobby is. Call Ryan's wife or children and ask them how they feel about their loss. And if you want, call my son's wife and ask her the same. Take the time to read what Sir Edmund Hillary had to say about climbing toward the end of his life. How many young men will die before you guys learn ? Tragic again. Best to his children and wife and to the other children and wives of those husbands who died doing what they loved.